Viluxur Holidays, Sri Lanka’s renowned luxury tour operator, recently hosted its staff members to a month-long familiarisation tour (FAM Tour) in six luxurious resorts and hotels in the Maldives. The tour operator, whose core objective is to deliver extraordinary holiday experiences to their customers, believes in setting themselves apart from competition by investing in the knowledge and experience of their employees who are in return geared to better serve their customer base. “Through the FAM Tours, our employees gain hands-on knowledge about how world-class resorts operate; they understand how destinations work and their unique factors. As part of the tours, our team meets the general managers, F&B managers, sales and reservations teams, housekeeping and butler staff to get a keen insight into each destination and experience,” she added. 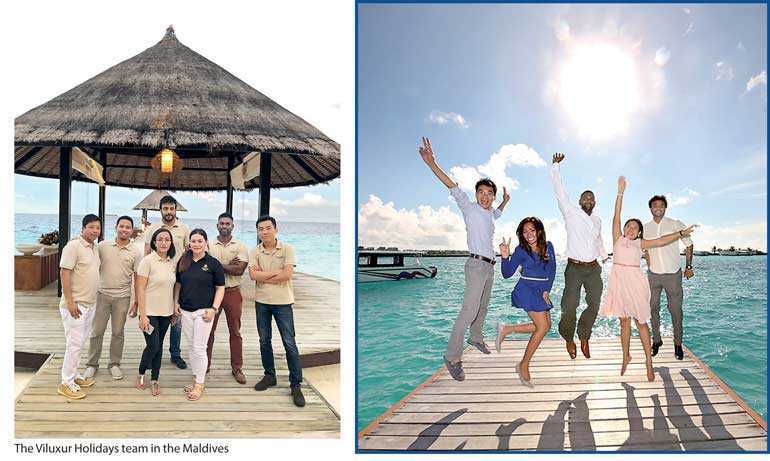 During their latest tour of the Maldives, the employees of Viluxur Holidays and OV Holidays (the B2C arm) visited some top-notch global hospitality brands such as Four Seasons, Soneva, Cheval Blanc, St. Regis, One and Only, Six Senses, and Jumeirah. “Our training programs, FAM Tours in particular, make our staff true destination specialists and equip them with real world experience and knowledge of how the global hospitality industry works. Further, the relationships that our team forms with the people on the ground at these destinations proves invaluable to them in their careers. In addition to product knowledge, imparted through FAM Tours and sessions with industry experts, Viluxur Holidays also equips their staff with soft skills and focus on behavioural aspects such as leadership, EQ development, conflict resolution, and perception management. They believe that optimum performance arises out of a healthy combination of job knowledge and behavioural objectives. Ultimately, as a seller of world-class travel experiences, they find their staff to be their biggest asset and invest in them to ensure that they are at the top of the game. Opulence by Viluxur Holidays, the B2C arm of Viluxur Holidays, has been awarded ‘Indian Ocean’s Leading Luxury Tour Operator’ by the World Travel Awards for the past four consecutive years. This is the ultimate testament to a successful home-grown company competing with the global giants to bring their country fame and honour.